If we needed someone to step up and save the world from the Mayan prediction of the end of the world on December 21, we couldn’t ask for a better candidate than the gravelly-voiced 8-time NBA All-Star, humanitarian and philanthropist Dikembe Mutombo. Old Spice has recruited Mutombo to undergo a series of 8-bit challenges to help carve more time into the Mayan calendar, and he’s got only 4 1/2 weeks to do it. In week 1: “The Great 2012 Dance Crisis”, Dikembe’s trusted bear friend, Science the Bear (just go with me here) informs him that Americans may be too distracted to vote by a South Korean dance craze. 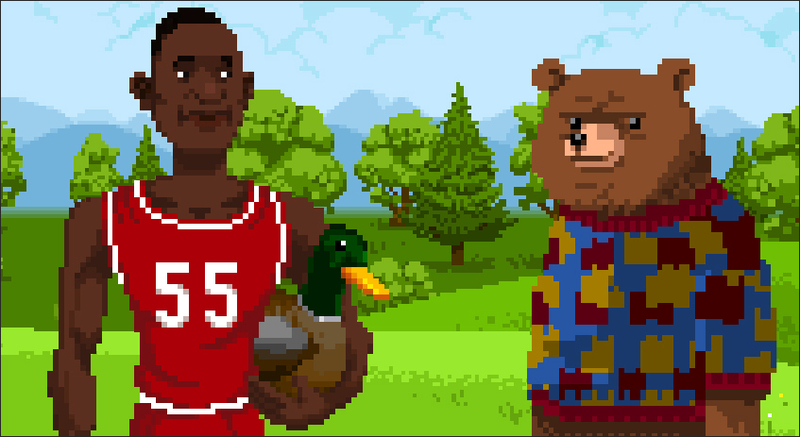 You must help Dikembe successfully deliver election ballots to dancing American voters. If that doesn’t sound batshit-crazy enough for you, the site is linked to a live video of a machine carving out a new ring onto a reproduction of the Mayan calendar. The campaign was created by Wieden + Kennedy Portland.